This is the Hoffman AB763 board kit. This board is a good replacement for the "reissue" amps, or to "roll your own" if you can build the chassis, cabinet, etc. The board comes "stuffed" with all components soldered in place via the standard "Hoffman" turret lugs. The board has a bias pot installed for bias adjustment (you can use the existing chassis mount with the Fender reissues), and comes in two versions from TheAirtightGarage, standard and upgraded. The standard version comes with all of the "stock" parts: carbon composition signal resistors, precision flameproof resistors in the power section, signal caps chosen for tone (Sprague, Poly, Mallory). 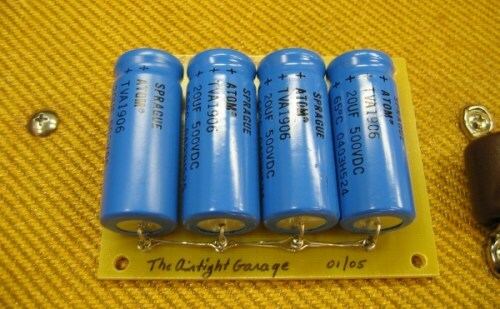 Sprague or other high quality electrolytics are used in the cathode bypass. The upgraded version consists of the same components as the standard version but the signal capacitors are replaced with high quality film in foil types. Note: This board differs from a "vintage" AB763 in that the tremolo does not use the optoisolater (which are hard to get and noisy). It uses the tremolo from a 1963-1964 Vibroverb. We then take that unit and add a little bit of gain to it so that it is BIG like the original. We get nothing but compliments on this circuit, so we have decided to leave the little mod in as stock. You will also receive the Hoffman install manual, and some "tips and tricks" notes from TheAirtightGarage to aid in installation. The picture of the AB763 shown here has a "half upgrade" in that the front end capacitors have been upgraded. If you would like a full upgrade select it as an option below, or if you would like just a front end upgrade, email or call. Note: The optional film and foil caps below will almost certainly add to the lead time on this board as they are not always in stock. Please be mindful of this when ordering. Chaissis, knobs, transformers, cabinet, speakers, tube sockets, tubes, switches, and "everything else" not included. You will receive the Hoffman board and the associated parts listed above. I recently decided to upgrade a DRRI to Hoffman standards an ..